While I feel like many players may not care that much and look over this small thing that im here complaining about (essentially), but when it comes to the forza wings that are in all forza games, the one made by forza that adds down force, ive always hated the look if it. I think it looks tacky on 95% percent of the cars. Personally, Id love to see some wing design variation give players the ability to choose a wing which they think looks best. Another point id like to make is, mainly on the Japanese cars which have a host of body modification options from Japanese tuner companies, why their wings dont add down force when they are a wing meant to add down force. Yes, I know not all wings like these are meant to add down force but there are some that are clearly meant to add down force to a car but forza makes them have a negative affect on performance of the car, making the wing useless and just for show. It feels like you have to use the forza wing to get any sort of added benefit from changing the rear wing out , and, personally, i think is hideous to look at. I think its been a sore point for most people who enjoy customizing their cars. You'd figure after six games this generation there'd be more options. Many of the cars in Forza 7 have way more body kit options but I dunno why Turn 10 doesn't use them. Mecham Designs is huge they make hoods, spoilers, side skirts, etc but I've never seen them in the game. Its like the modern race suits too, instead of just going with a generic un-offensive wing like the 360 generation, they have gone their own way. With the race suits, the helmets look odd and too chunky, the hands device is giant and the suits look like motorbike leathers made from Nomex. The hatchback wing doesn't look good and doesn't look like any hatchback wing on any race car on the planet and the standard is just as bad. I just hope we can get more believable Forza aero and wide bodies instead of the gamified fantasy stuff we have now. Anyone remember the diffuser with the exhaust sticking out of a porthole on the back bumper. I wonder why they went in the SEMA car by 10 year old Timmy direction over the track car GT went for. 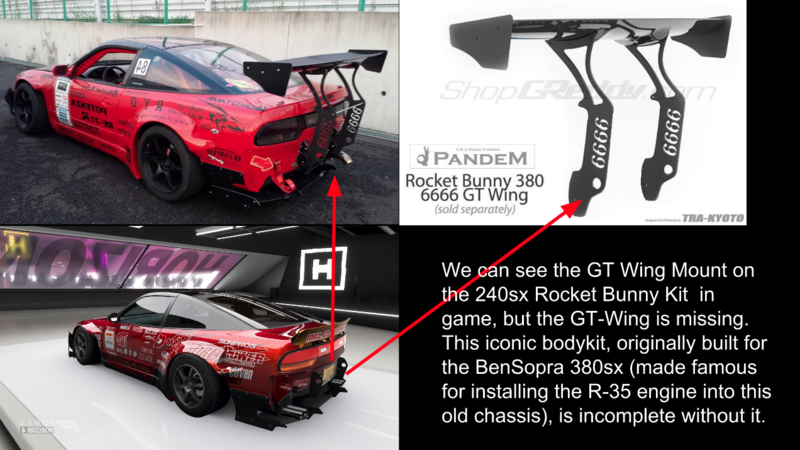 On a similar note, what is going on with those liberty walk diffusers, and what is with the lumpy part of the wing between the supports on the LB cars? I'll never understand the point of fake aero that doesn't work. A licence with APR or Voltex, etc would be great in future. I've always hated the way Forza wings sit really far forward and narrow, and some of the splitters are just AWFUL. I had an idea i think is cool.... The Aero menu can be called "Wind Tunnel' which has car sitting in front of big fans with smoke lines. as you change different wings, splitters, end plates, defussers, ride height, etc It'll measure changes in Downforce vs Drag, Front vs Rear which you can toggle the speed the measurement is taken. A simulation of Motorsport Engineering. Customisation has never been Forza's strong-point. We actually lost body upgrades & the ability to paint brake calipers after Forza Motorsport 2. Until Forza Horizon 4, things never really improved. I won't turn this into a wishlist, but there are very simplistic paint & body kit options that should be in the game by now. Hopefully we get improvements but I wouldn't hold my breath. I thought I was the only one. Nobody ever complained about it so I always shut my mouth...but now I can finally say it aloud: I hate the look of that freaking wing and it looks bad on almost any car. How hard can it be to add a set of 2 or 3 new wings? You're not. It's a topic that has come up time to time for years. I think FM3 was when the wings got really ugly (I started mid way through FM2). At least in FM7 and FM6 the wings differ for some types of cars (some are adjustable spoilers) vs the gigantic wing that was uniform in prior iterations. This would be mesmerizing to see and useful and fun. fluid dynamics all daynight long. They looked beefier on the 360 generation Forzas. Now they're just flimsy.